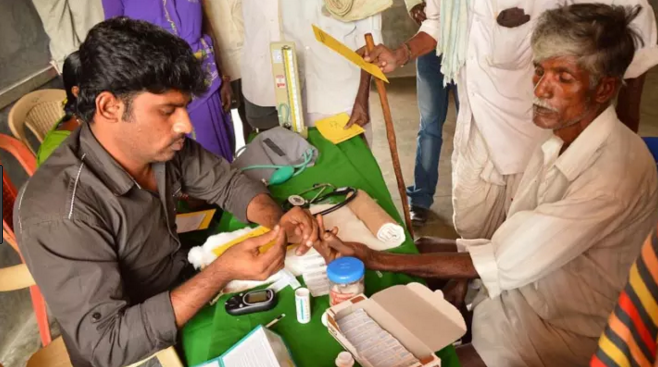 A recent paper, published in a top London-based research journal, BMP Open, has said that the out of pocket (OOP) expenditure on healthcare in general and medicines in particular, over the last two decades, has gone up from 4.49% to 6.77% in India, leading to “financial catastrophe” of 18% of the country’s households. Calling it a “significant increase since 1993–1994”, the paper, “Quantifying the financial burden of households’ out-of-pocket payments on medicines in India”, by Sakthivel Selvaraj, Habib Hasan Farooqui and Anup Karan, says that, as against this, the proportion of OOP expenditure on food and non-food items has remained more or less stagnant. The paper further says that OOP on medical expenditure was particularly “catastrophic” for the poorer 10% of the population, pushing 3.09% or 38 million persons, into poverty. “Among the leading cause of diseases that caused significant OOP payments are cancers, injuries, cardiovascular diseases, genitourinary conditions and mental disorders”, the report adds. At the same time, the paper says, "The number of households facing catastrophe" on account of medical expenditure "is approximately 46 millions", of which 29 million households incurred catastrophe on account of OOP payments on medicines alone." On the other hand, the paper says, evidence about government expenditure on medicines in India shows that, on an average, government spent about 10% of health expenditure on medicines. However, the national average masks significant under-spending on medicines by several state governments, “with many reportedly spending less than 5% of their health budgets. “If we were to net out food expenditure from total household consumption spending, which are considered a necessity, the share of health spending remained stagnant but as high as 11%–12% during the period under consideration”, the report notes. Why ? Now they have the generic medicines, free dialysis; 5 lacs insurance ; and they also get cover with banking schemes; that I know because we did it for all our staff; reduced price of Valves ; knee operations etc etc ; free treatment for ST Sc health card holders . So I don't understand ? You are absolutely right, God knows when will government make serious & strict policy?